Roses can bring beauty and grace to your garden, and they smell great too! 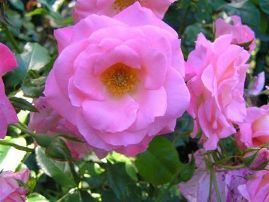 Growing Roses is an area of gardening that we wish were more knowledgeable in, but we are not. There are so many different facets to gardening that one cannot possibly be an expert in all of them. We often visit gardens that have beautiful, fragrant displays and wish that we had room for them in our garden, and think "Maybe next year..."
When considering which varieties to grow, the usual caveats as to hardiness, size, disease tolerance, color and length of bloom should be taken into consideration. It’s easy to be overwhelmed by the sheer number of varieties that are available. A good tip is to look around your town and see which cultivars are doing the best and use that as a starting point. Our friends over at Love-of-Roses.com who took the lovely picture above know a lot more about roses than we do and we encourage you to visit their website.